Eunice Kennedy Shriver founded Special Olympics for those with intellectual disabilities for children of her generation and for more and more children for years to come. That is why Eunice Kenndey Shriver enjoyed her job. Eunice Kenndey Shriver is such incredible, remarkable, and strong-willed lady. Thanks to her and the whole Shriver clan we have Special Olympics. Now athletes with intellectual disabilities have a place to be accepted to be respected. 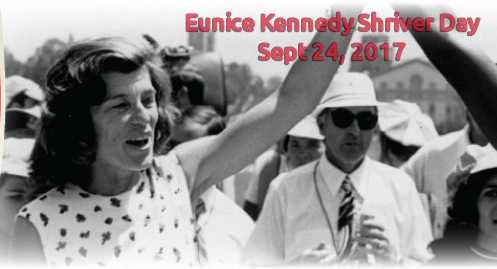 We also thank the Special Olympics staff that we are still carrying on Eunice Kenndey Shriver's legacy. At Special Olympics Nebraska, we are also still carrying on Kerri Orozco's wishes we are still holding onto the flame of hope. Kerrie Orozco lived by the words joy, caring, sharing, respect and acceptance. It is challenging to live with an intellectual disability, but athletes know who we are, and thanks to Special Olympics staff us athletes are now on the top of the world. A huge thanks to Euncie Kenndey Shriver and to everyone who got us where we are today: Euncie Kenndey Shriver, Kerri Orozco, everyone in the world and all our parents. Thank you Special Olympics staff you put the movement in action thank you for everything you do.